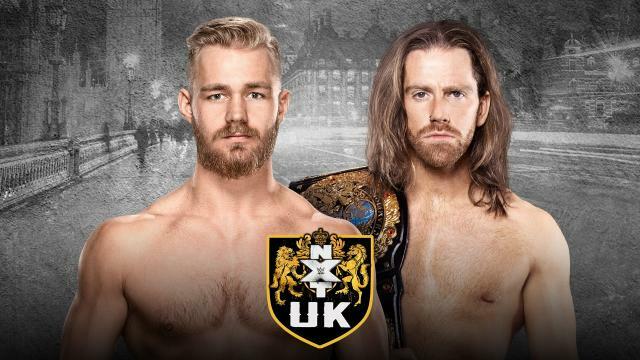 Good afternoon Fight Fans, we hope you're having a great day, and will enjoy today's edition of NXT UK! -NXT General Manager Johnny Saint and Assistant General Manager Sid Scala are in the ring before Pete Dunne comes out and demands to face WALTER before leaving. Ligero starts the match off by focusing on the legs of Eddie, trying to chop him down before getting a quick two count and kicking him in the chest. Ligero kicks Eddie out of the ring before Eddie catches him and hits a spinning uranage onto the apron before rolling him back into the ring and whipping him into the corner. Eddie locks in a cravat that Ligero fights out of before Eddie rains down elbows in mount and whips him across the ring. Ligero hits an enzuigiri that sends Eddie out of the ring before hitting a huricanrrana and tossing Eddie back into the ring. Ligero hits a springboard splash for a two count before Eddie comes back with a clothesline and Ligero hits an enzuigiri into a code red for a near fall. Eddie then catches Ligero up top and hits a superplex before hitting a buckle bomb and the Next Stop Driver for the pin and the win. Winner: Eddie Dennis defeats Ligero via pinfall with the Next Stop Driver. Primate and Sam start the match off with Primate hitting an overhead suplex and tags in Wild who hits a fall away slam and The Hunt double team Sam before Primate hits a German suplex and Lewis rushes Primate. Primate headbutts Lewis and uses Wild as a weapon before he hits a cannonball in the corner and they hit an assisted high angle back drop driver for the pin and the win. Winner: The Hunt defeat Sam Stoker and Lewis Howley when Wild Boar pins Lewis with a high angle back drop driver.